Inspector Hale Budd visited the Pyrete District in 1862 after recieving a "memorial" from the inhabitants stating that they wished to establish a school. The report he wrote is dated 25th November, 1862. On his arrival, he found that the people of Pyrete had built a new weatherboard building at a cost of 35 pounds 10 shillings. The building measured 30 feet by 12 feet, and the other, the school room, measured 20 feet by 12 feet. 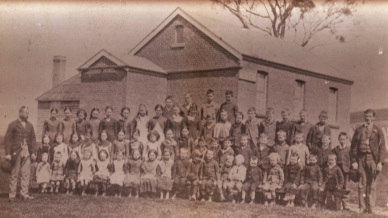 It was generally the case to have a government site alloted for a school before the building was erected. For Pyrete, however the reverse was the case and it was likely that official aid was delayed due to the slowness in having the size gazetted. The inital allotment granted was two acres, added to in later years. within 7 working days of submission of this form. A confirmation email will be sent after form submission and payment is recEIved.